I seem to have severely sensitive teeth right at the gum line, especially to cold, sweet foods and drinks. I've tried over-the-counter remedies, but nothing seems to work. What should I do? It may surprise you to learn that you are not alone. It is estimated that as many as 35% of the US population suffers from tooth sensitivity. Let's review the cause or causes in order to understand how best to treat it. 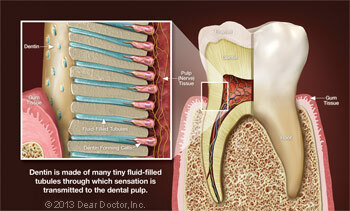 Gums can recede (shrink away) from the tooth and expose the root surface. Improper or overly aggressive tooth brushing can cause this. If you have sensitive teeth, show your dentist or hygienist how you brush and the brush you use. They can make sure you're not overdoing it and that your toothbrush isn't too hard or worn. It is estimated that as many as 35% of the US population suffers from tooth sensitivity. Saliva and its components can neutralize and buffer acids in about 30 to 60 minutes following exposure to these harmful substances. Rinsing your teeth with water can aid this process. In addition, saliva can dilute and help remove erosive agents. Acidity and alkalinity are measured in pH units from 1 - 14. The mouth is generally neutral, at level pH 7. 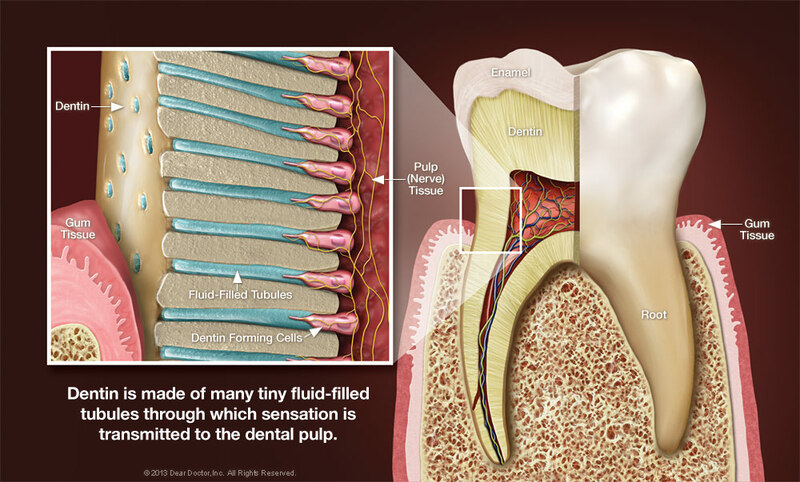 Dentin has a critical pH of approximately 6.0 to 6.2 below which dissolution begins. Thus, saliva has a critical role not only in preventing teeth from losing minerals (demineralization), but also in bringing minerals back to the teeth (remineralization). Since saliva is so important in combating sensitivity, your dentist might recommend one of several products available to enhance your saliva's protective and remineralizing properties. These include toothpastes containing high concentrations of fluoride, up to 5,000 parts per million (ppm), used for both remineralization and treatment of sensitivity, available by prescription. Others that you can use at home contain various forms of additional calcium and some polishing pastes used in the dentist's office contain amino acids associated with remineralization; they are generally not available over the counter. Dentinal hypersensitivity can have multiple overlapping causes, so you'll need to have a detailed discussion about your sensitive teeth with your dentist before undergoing any course of treatment. After conducting a thorough examination, your dentist will be able to diagnose exactly what is causing your sensitivity and develop a personalized plan just right for you.